Dr. Sheldon Hurst, curator, with Alison & Michael Paolercio, collectors, enjoy the opening reception for What Was He Thinking? 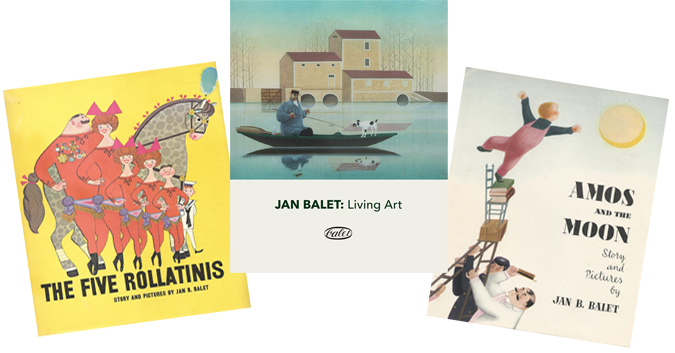 Jan Balet: Watercolors & Lithographs, featuring the collection of Michael & Alison Paolercio. California collector shares his extensive group of Balet lithos for fall exhibition. More of Jan’s connections with music. The picture behind the Grammy! Some of Jan's clever images made their way into the world of music. Jan put a hint of humor – and humanity – in all his works – even the cards he created for his friends. Listen to Jan Balet talk about how important his grandfather, Eduard Eggert (1852-1926), was in helping him develop his artistic talents. One of the things that we hoped to accomplish when we launched janbalet.com was that we would connect with art lovers who owned some of my father’s work. How did Jan decide on titles for his paintings? When it came to details for his first children’s book, the hand-lettered cover tells a tale. Among the many items left behind by Jan, a small scrap of paper sheds light on what it was like for him to live life as an artist. Jan shares his unique take on keeping his tombstone in his house. While working as a commercial artist in New York City, my father ventured into the world of writing and illustrating children’s books. For those of you who don’t know much about Jan Balet, you are not alone. His fine art, much celebrated in Europe, never got the same recognition in the U.S. because here, Jan was a commercial illustrator. Those that know his work from Harper’s Bazaar, Good Housekeeping, Vogue, and Saturday Evening Post in the ‘50s and ‘60s may think that’s all there is.